William Acevedo with translations by Mei Cheung. 2014. “Republic Period Guoshu Periodicals.” Classic Fighting Arts. Vol 2. No. 26 Issue 49. pp. 56-68. 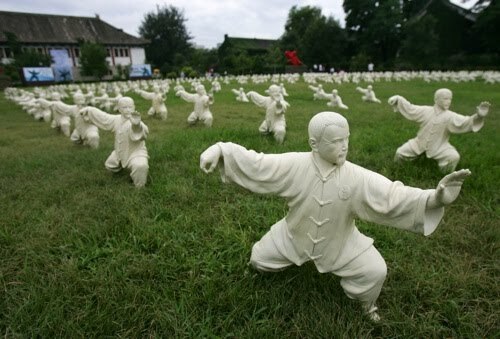 Despite frequent assertions to the contrary, it is not true that the Chinese martial arts lack a written history. I suspect the main reason that this myth persists is that individuals insist on looking for documents that would validate mythological narratives of the past. It may be the case that the fantasy of the “ancient and unchanging” martial arts left no record. But even in this case there are a myriad of novels, short stories, serialized radio programs and early films documenting the evolution of this fantasy corpus. 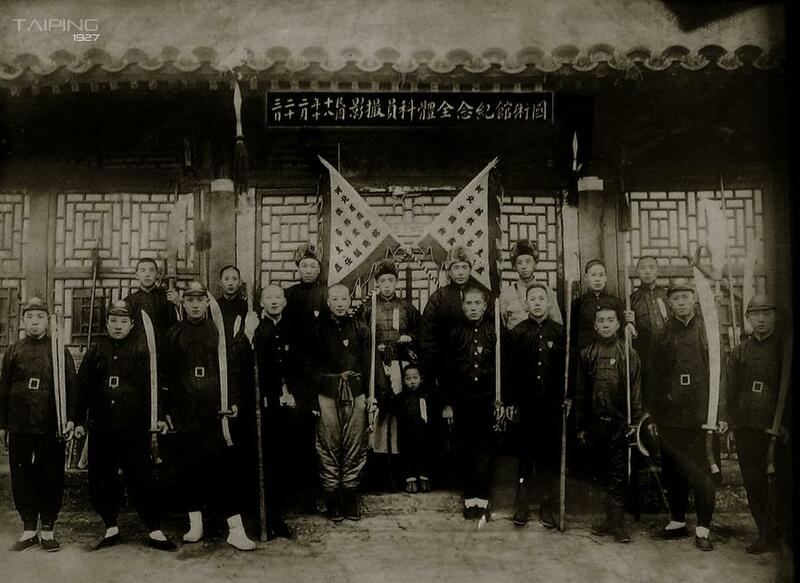 The Chinese martial arts as they exist today are very much a product of the late Qing dynasty and the following periods of warlordism and Nationalist Party rule. These were times of tremendous change and social upheaval. The first decades of the 20th century saw rapid economic reforms, urbanization, increased global integration, social liberalization, modernization and rapid growth of nationalism. Most of the martial arts that are practiced today emerged out of this process. Indeed, we can learn a great deal about how these variables impacted different regions and eras of Chinese popular culture by taking a closer look at how specific fighting systems evolved and were discussed by the local community. Fortunately for both historians and students of cultural studies, the first half of the 20th century also saw the rapid growth of both an urban middle class and rising literacy rates. Short chapbooks and manuals on topics like archery and boxing had been printed and distributed during the 19th century. But the transformation of the martial arts marketplace in the early 20th century saw a veritable explosion in printed resources. Most of these sought to introduce the newly empowered (and economically potent) urban middle class to the mysteries of traditional boxing. Indeed, teachers and reformers across the country realized that if the martial arts were to survive they would have to find a foothold in this new market. The end result of all of this is that for a supposedly “oral tradition”, both the technical evolution and social debates surrounding the development of the modern Chinese martial arts are surprisingly well documented. Unfortunately the vast majority of these resources remain unavailable outside of a handful of university libraries and private collections in China, Taiwan and Hong Kong. A few scholars, notably individuals like Andrew Morris, Stanley Henning and Brian Kennedy have sought to introduce some of this literature to western students. Yet our understanding of what resources are potentially out there remains sketchy at best. Nor do most modern martial artists realize that there were often very sophisticated debates on many of the same topics that we still discuss today in the early 20th century. I personally suspect that half-remembered echoes of these discussions had an important impact on the evolution of the martial arts in places like Hong Kong in the 1950s and 1960s, and their effects are still lingering. Yet by in larger the early 20th century Chinese language literature remains an undiscovered country for most students of martial studies. Gratefully there has been some progress in this area in recent years, but many questions remain. Some corners of this literature have barely been discussed by western researchers. This post reviews a recent article by William Acevedo (with translations by Mei Cheung) that makes an important contribution to our understanding of the popular literature on the Chinese martial arts between the 1920s and the 1940s. In a recent edition of the magazine Classical Fighting Arts Acevedo published and explored a database of 44 different journals dedicated to the study of hand combat during the Republican period. There is a lot of variation in these periodicals, both in terms of their geographic origin, ideological orientation and relationship with the larger Guoshu project. About half of these magazines struggled to survive and had print runs of less than a year. A few managed to stay in circulation for decades and had a major impact on the national conversation surrounding the martial arts. After presenting a brief survey of his findings, Acevedo used these resources to describe the goals, accomplishments and challenges of the Nationalist sponsored Guoshu project in greater detail. Other authors, including Henning and Morris, have already provided us with a basic framework for understanding the Guoshu era of the traditional Chinese martial arts. Nevertheless, the research discussed in this article makes a fascinating and original contribution to the literature. Acevedo’s emphasis on popular publication between the 1920s – 1940s brings much needed depth to our understanding of the public debates that happened during this period. Further, his database of period publications will be a valuable resource for both historical and cultural students seeking to understand what resources are available to them (and need to be consulted) when writing on more specific topics. As such I suspect that a wide variety of readers here at Kung Fu Tea will find this article to be both helpful and interesting. A Guoshu school located in Tianjin, 1927. Source: The Taiping Institute. We should probably start out by saying a few words about the Classical Fighting Arts magazine. Students of Chinese martial studies may be unfamiliar with this publication. Published quarterly by Dragon Associates in California, this magazine covers the traditional fighting arts of Okinawa, Japan and China. The vast majority of the articles seem to be dedicated to classical Karate, but a few articles a year cover other Japanese and Chinese fighting arts. The quality of the writing in CFA is generally quite high. While the articles are not meant to be strictly academic, they often cover topics that are interesting to more historically inclined students of the martial arts. While CFA publishes relatively few articles on the Chinese fighting systems, many of the ones that it has distributed have been written by highly regarded authors. These essays occupy a difficult middle ground in that they are more scholarly in their orientation and interests than the vast majority of discussions in other popular magazines (Black Belt, Combat, Kung Fu Taiji), yet they are not intended to be formally academic or to respond to issues in the peer reviewed journal literature. Still, this is a source that students of Chinese martial studies should be aware of. I greatly appreciated the fact that Acevedo had enough space to fully develop his arguments and to present his sources. While I will always walk away from an item that I liked wanting to hear more about its methods and its research findings, it is still very refreshing to see something approaching the length of an actual journal article in an age that is increasingly dominated by 900 word columns. Acevedo begins his paper by reviewing the contours of the larger debate between the “New Culture” and the “National Essence” movements in post-1915 China. Briefly the New Culture movement sought to build a strong state through the rejection of older social and cultural models and the aggressive adoption of modern western practices. The National Essence strategy, while still accepting the basic goals of modernization and national reform, emphasized instead the need to retain what was “essentially Chinese” while strengthening the state. As Morris and Brownell have already demonstrated, both of these movements had their own ideas for how physical culture should be reformed and utilized in strengthening the new Chinese nation. Generally speaking the New Culture movement was more hostile to the traditional fighting arts and advocated the adoption of “modern and scientific” western sports. 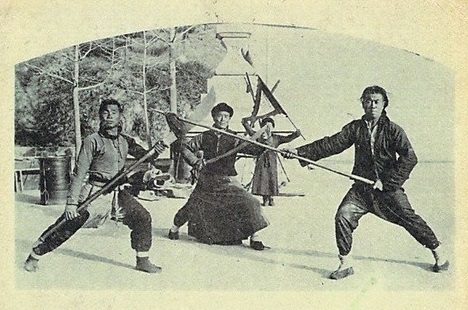 Some advocates of the National Essence approach championed the traditional Chinese martial arts as having a place in the modern world, though they actively sought to demonstrate that these practices could be rationalized and were at heart “scientific” once the superstition and secrecy that had caused their “degeneration” in the Qing dynasty was stripped away. Obviously both the Jingwu movement and the Central Guoshu Institute, the two organizations responsible for the majority of the publication reviewed by Acevedo, were products of the National Essence movement. Still, while the author treats them both together it is worth remembering that the two movements were not identical. Morris has argued that while similar in their fundamental impulses, they actually had pretty different ideas of how the Chinese nation should be conceptualized and how the martial arts stood in relationship to society and the state. While this is beyond the scope of Acevedo’s article, it did occur to me that it might help to explain why the Guoshu movement’s publications were markedly less successful in certain areas (such as Guangdong, Fujian and South East Asia) where the Jingwu Association had previously enjoyed great success. This discussion is of more than just general historical interest. It allows Acevedo to then argue that the emergence of a robust periodical literature in the 1920s was not simply incidental to the growing success of these movements. Rather it was a critical aspect of both the self-image of various martial reformers as well as an important tool by which they sought to spread their vision, and ultimately bring about the transformation of the traditional Chinese martial arts. By publishing a “modern” journal these groups hoped to demonstrate that the martial arts were not mired in secrecy and illiteracy as their critics in the New Culture movement claimed. The very act of publishing created the transparency that these groups sought to promote. These journals also gave them a platform to articulate their argument that the martial arts could be a valuable tool in strengthening not just the health of the citizens, but their attachment to the nation as well. Political reformers throughout the Republican era seemed to doubt the patriotism of the common man (in fact this was often blamed for the failure of all sorts of poorly implemented reforms), so any plan to solve this “problem” was sure to get a receptive hearing. Still, there were real limitations to the conversation that emerged within the pages of these periodicals. While they succeeded in developing a vision of a rectified and nationalized martial arts practice, Acevedo points out that we have to be very suspicious of how successful they were in actually evangelizing that message. The vast majority of these journals were printed and circulated in areas controlled by cliques within the KMT that were loyal to Chang Kai-shek. In practice this means that the message of the Guoshu periodicals got a lot of traction along the major cities of China’s east coast (especially shanghai), and parts of the North. Yet other areas of the country, including the West and South, had very little exposure to this material. In fact, one of the most interesting things about the database of publications presented at the end of this article is that it allows us to confirm what Morris and others had suspected about the actual reach of the Guoshu Institute’s message. In addition to reviewing the shape and distribution of this period literature Acevedo also calls on it to illustrate a number of points about the nature of the Guoshu movement within the Chinese martial arts community. His discussions of “Defining the Martial Arts” and the “Guoshu Concept” were both well done and many readers will find them to be informative. His later review of the evolution of sporting competition and military drill (Dadao, Pi Ci, bayonet practice) within the Guoshu movement brings additional sources to the discussion of popular topics within the field of Chinese martial arts history. I also enjoyed the selection of illustrations that accompanied this article. As one might expect there are some great period photographs culled from the pages of the magazines that Acevedo reviews. However, my favorite image was of a Tiger Balm advertisement from a 1930s martial arts magazine. In addition to reminding us that the “traditional” Chinese martial arts that we now enjoy are ultimately a product of commercial markets, I was surprised to see how little the packaging of this quintessential product has changed in the last 80 years. Detail of postcard showing traditional practitioners performing in a marketplace. Japanese postcard circa 1920. One sure sign of this article’s effectiveness is that it leaves you wanting more. As a relative brief essay in a non-academic outlet Acevedo has succeeded in arguing for the importance of the periodical literature of the Guoshu era as a resource for those attempting to understand the debates surrounding the reform of the martial arts and traditional physical culture. This is a critical task. While texts from this period are slowly being translated and brought under scholarly consideration, most of the emphasis has been on technical manuals and more philosophical works. The list of publications provided at the end of this article is a great resource for individuals who want to look more closely at developments in specific regions or communities. Still, I think that this project can be pushed further. Academic researchers would benefit from a greatly expanded database that included not just the titles of journals, but perhaps the table of contents for various issues as well. It would probably be impossible to make digital scans of all of this material, but it might be possible to piece together a better idea of what sort of content the various journals covered and how that changed over the years. Additionally scholars would probably like to hear a little more about how Acevedo managed to pull this database together. In my own limited experience doing research with Chinese libraries can be challenging. Not everything is catalogued (especially when dealing with special collections) and not all computer systems talk to each other. Knowing which collections hold which journals (and which, if any have been made available electronically) would be a critical step in turning the current list into a more robust data source. While a challenge, it is not impossible to imagine a doctoral dissertation that might involve the creation of just such an expanded database. Of course any attempt to delve into the actual publication histories of some these journals will raise other problems that readers will need to consider. For instance, I noticed that a number of the journals in Acevedo’s database had a one year print run. So is this all that is actually available? Maybe not. I know from my own research on the Foshan chapter of the Jingwu Association that their periodical had a complicated history (and local importance) that belies its short print run. It seems to have started as a local newsletter, it evolved into a newspaper, and only then into a regular periodical. I would not be surprised to discover that the same thing may have happened in other places as small organizations attempted to professionalize themselves. Who knows what if any of this material has survived? But it does raise issues that scholars should be aware of when constructing the next generation of more detailed databases. Lastly, when working with any of the Jingwu/Guoshu era sources, scholars must be on guard against too easily accepting the world view that we find reflected in their pages. Obviously it is very difficult, almost impossible really, to do historical research without a body of period documents. As more individuals become interested in Chinese martial studies we will certainly be hearing a lot more about these sources. That is great, but it is also critical that we remember what they are not telling us. The Guoshu view of the martial arts was only one voice in the larger national debate about physical culture. No matter how authoritatively it spoke with, or how much government backing it seems to have enjoyed, we need to remember that this was a minority view. To see how, consider the debate between the New Culture and National Essence movements that Acevedo introduced his discussion with. While the views of the National Essence movement ended up winning the day in certain quasi-official government circles having to do with the co-optation of the martial arts, it is important to remember that they did not win everywhere. For instance, in the field of medicine the Nationalist were perfectly happy to toss traditional Chinese medicine on the rubbish heap of history and adopt western models. Likewise, when discussing physical culture in China in the 1920s-1930s it is important to remember that western sporting events were vastly more popular than the martial arts. While some martial reformers adopted the views of the National Essence movement and carved out a niche for themselves, the majority of the Chinese people (and government officials) remained unconvinced. It is also critical to remember that the views of the National Essence movement did not reflect the beliefs or practices of the majority of martial arts teachers in China during this period. Most local marketplaces were dominated by traditional teachers who remain deeply steeped in language of lineage and secrecy. They had no need of “scientific reform” and “modernization” as their schools were often quite successful. The rhetoric of the Guoshu Institute was that of a relatively small number of reformers who were attempting to subvert or appropriate this much larger martial arts sector. Likewise when looking at the periodical literature we need to remember that the voices and concerns that we are hearing represent a certain segment of reformers. Most local teachers did not produce their own magazines or newspapers. Further, their thoughts about how the martial arts related to local and regional communities may have been quite different from the statist and nationalist ideals held by Guoshu ideologues. When reviewing this literature it is important to remember that it reflects not a broad and deep national consensus, but the views of a double minority. Most Chinese citizens and government officials were much more interested in track and field in the 1930s than they were traditional boxing. And of those who did take an active interest in the martial arts, most were involved with more traditional and local practices. In short they were investing themselves in precisely the sorts of things that the Jingwu and Guoshu reformers railed against. This should not be taken as an argument that we should ignore these movements. Indeed we cannot. While a minority view among all martial artists in the 1920s, they did have a critical impact on intellectuals and some government elites. This effect continues to be felt today, from calls to do away with “secret teachings,” to the evolution of sport Wushu in mainland China. The historical legacy of the Guoshu movement is of vital interest to students of Chinese martial studies and Acevedo’s reminder of the importance of its periodical literature is helpful and timely. Still, to fully appreciate this movement we much place it within the broader context of Chinese popular culture. That means approaching its description of the martial arts community of the Republican period with a certain degree skepticism. If you enjoyed this you might also want to read: Lives of Chinese Martial Artists (10): Chen Shichao and Chen Gongzhe: Creating the Jingwu Revolution. 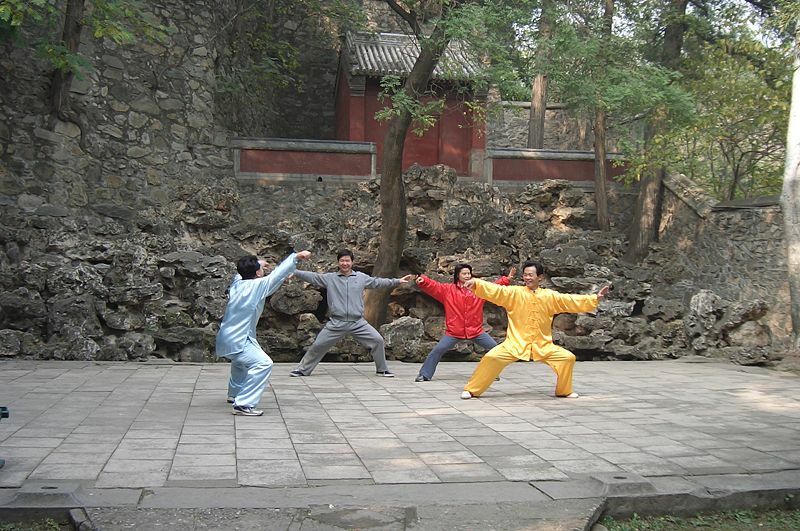 Chen style Taijiquan practitioners at the Fragrant Hills Park in Beijing, 2004. Source: Wikimedia. I would argue that the vast majority of Chinese martial arts today are very much the product of the CCP propaganda machine starting in the early 1950’s. Mao as far back as 1917 argued against the Confucian notion of ‘physical culture’ (or lack thereof) and for a stronger, fit China – politically, socially and physically. The emergence of Shaolin & Wudang as pseudo-spiritual martial arts ‘hubs’ bears witness to this. Hi Dennis, thanks for your comment and stopping by. If you don’t mind, let me ask you a follow-up question. If memory serves Ma Mingda has argued that one of the reasons why we need to dedicate more scholarly attention to Guoshu is precisely that it laid some of the foundation for what would happen post-1950. And it seems like he thinks that it could act as a sort of corrective against some of the things that he doesn’t like in modern Wushu. What do you think of that argument. In your opinion, how instrumental was Guoshu in creating a foundation for what would happen later on. Can we think of modern Wushu as a continuation of this agenda, or was it something that evolved out of a different set of influences? We are glad you enjoy the article and thank you for your thoughful review. Rest assure that we will be working on other pieces in the near future. Last but not least we have to acknowledge the help received from Stanley Henning and Dennis Rovere to our understanding of this period of Chinese history. I apologize for the lack of response to your question. I’m currently being treated to restore vision in my left eye so reading and writing are limited at the moment. As well, I just returned from Hong Kong and Taiwan and only now have time to respond. In my opinion the guoshu movement was both positive and negative. Positive in that it helped to further nationalism and create a more ‘Chinese’ approach to physical culture that unfortunately directly paved the way for modern wushu style gymnastics. Having trained under a teacher who taught at the Nanjing Military Academy (Whampoa) and who was good friends with many of the “masters” we like to spin stories about, my take is perhaps somewhat different than the majority of martial artists looking at this question today. 3. The warping of history and the promotion of martial art ‘fiction’ is still as prevalent now as it was in the time of T’ang Hao in the early 1920’s. Of course, one should never let the truth get in the way of a good story, but the rewriting and misinterpretation of the past further creates demise in the understanding and preservation of Chinese martial arts as it was traditionally understood. (I’ve seen this personally during an argument with a xingyi practitioner. I have some pretty solid credentials culturally, academically and martial art-wise, but he dismissed them all out of hand because he and his teacher had both fought in ‘kung fu tournaments” and my opinion didn’t meet his level of misunderstanding of Chinese martial arts.) Nowadays, I’ve seen several martial art ‘historians’ read a book on military martial arts and then expound on its application in the Chinese military. (Having first hand knowledge of Chinese military training, I have pointed this out on several occasions – but again their lack of knowledge and understanding is disheartening. As I pointed out to William Acevedo who wrote this very interesting article on guoshu publications, one of his illustrations late 1920’s showed a bayonet technique that cannot be effectively done using a rifle. So it’s obvious to me that history repeats itself often in not the best ways. There is more but I have to limit my reading and writing until my eye improves. Hope this helped to give insight to your question. I do agree with Prof. Ma about researching the past when it comes to guoshu and the future of Chinese martial arts. However, I know of very few people that are capable of doing so and as such, this type of scholarship will continue to lag. Thanks so much for your detailed response. There is a lot to think about in there. Best wishes for a speedy recovery!